Last night THE WALKING DEAD was the winter premiere and it returned with a bang and as usual an amazing episode, did you see it? If you missed any of it, you can read our full and detailed recap HERE. I cannot wait until next week’s episode and we managed to get our hands on some juicy spoilers for you of The Walking Dead Season 3 Episode 10, “Home” and 3 sneak peek videos below. Looking ahead at The Walking Dead, Rick’s hallucinations are going to return, is he headed to meet Lori in the big Walking Dead in the sky? I don’t think so but Tyrese and his group have to be questioning if they should in fact be aligning with this new group. Daryl is in the woods with his brother Merle and he’s getting tired of being there, meanwhile Merle thinks Daryl is leading him to the prison and to Rick and his group. 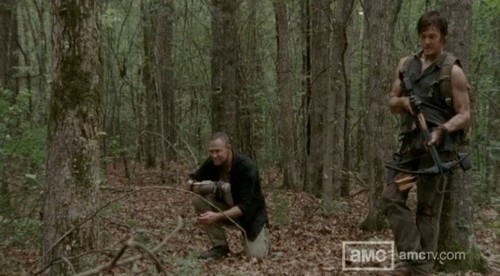 Daryl tells him it’s not a bad idea, at least they would be safe and have food. 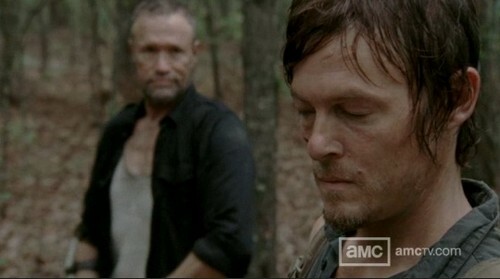 Merle tells him that the Governor is going to attack his friends, there is no doubt in his mind. Now even though Daryl took off with Merle, he does aim his crossbow at his bro in the next episode – good to see that Daryl cannot be pressured by his bullying sibling. Andrea wants to go to the prison and see her old friends, but the Governor tells her that she is needed in Woodbury. Meanwhile, the Governor reveals to Milton that Andrea cannot be trusted, hence the reason why he doesn’t want her to return to her friends. Hershel is afraid for the group’s safety and wants them to leave the prison before the Governor attacks but Glenn tells him that they cannot run, it’s not a solution. The only thing Glen has on his mind is going after the Governor before he gathers up his forces and attacks, but he can’t do that without the help of Michonne. Some of the group think that the Governor may have been scared off and won’t attack, but Michonne reveals how sick and twisted he was with his severed heads in the fish tanks and assures them, he is going to attack. The Dixon brothers do catch up with Rick and his group and warn them about the impending attack. Rick wants to go back to his hometown and find Morgan who saved him in season one and who he was recently head speaking to on a walkie-talkie but Hershel urges him to stay where he is needed. Next week’s episode is going to be amazing, after a long and much anticipated wait; we are finally going to see the Governor and Rick at war.